Figure 1. 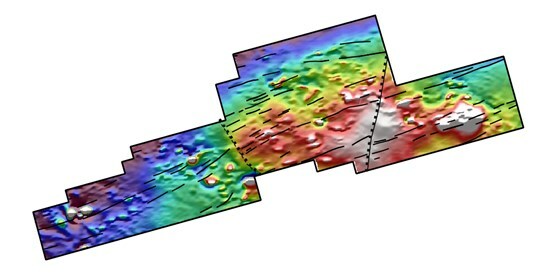 Monster Property with faults that control the depth of exposure (NW and SE) and a fault set (ENE) that partly controls IOCG alteration of the Wernecke Breccia, associated magnetic targets and mineralization shown on a total magnetic intensity map. The new structural framework identified no less than four major fault systems that intersect in several places on the Monster Property. One of the intersections is in the Arena, an area that hosts several surface showings. This area was a major focus of the 2018 field season. The 2018 program yielded samples of up to 3.81% Cu, 2.96% Co, 53.5 g/t Ag, and 0.5 g/t Au from 31 grab samples. The Monster Property is a large 62.5 Km2 copper cobalt property in Yukon, Canada. Mineralization on the claim is akin to IOCG deposits like the Olympic Dam project in Australia. The commissioned structural interpretation was based a newly available 2-m resolution DEM and on the magnetic data set acquired during the 2018 exploration program. The work has been carried out by Rodrigo Diaz, an IOCG specialist based in Chile. He has been involved with the Monster Property since 2018, when he spent several months on a spectral survey and data compilation. His work has previously led to the discovery of several copper showings on the Monster Property. Because faults provide mineralizing fluids with pathways and mechanical nozzles their identification is crucial for an understanding of the mineral system. The structural framework will allow Go Cobalt to target mineralization with greater certainty. Go Cobalt is reprocessing historical gravity data. Roughly 600 data points are being reprocessed using a new digital elevation model. The data will subsequently be inverted. Combined, gravity and magnetic data are powerful tools for IOCG targeting. Go Cobalt is a Vancouver based mining exploration company. We develop exciting Canadian energy metal projects to help meet demand for a battery powered future.